After details seeped out elsewhere last week, today saw the official unveiling of the Acer Timeline X. We popped along to see the new models at their launch in central London. A 12-hour battery life is cited for the Timeline X, though this doesn't apply to the cheaper £599 models – you'll be paying a couple of hundred pounds more for that privilege. Up to nine different variants will be launched by Acer, employing the Core i3, i5 and i7 processors, while different models also pack AMD Mobility Radeon HD 5000 Series graphics up to the HD 5650 with 1GB of onboard memory. All have LED backlit displays, helped along by Intel display technology that conserves battery power. These are touted as thin and light laptops. In reality they're not – 24mm is the cited thinnest model, but as a rule the range isn't exactly lightweight, between 1.4Kg and 2.4Kg. 3 to 4GB of RAM is standard, with a minimum of 250GB of storage. This is the 14-inch model. The headline models are the 13.3-inch 3820T, 14-inch 4820T and the 15.6-inch 8820T. An 11.6-inch model will also be available (baggsy that one), but Acer representatives admitted that model wouldn't be with us "until Q2" – that's June to the rest of us. As you'd expect, the different variants of the Timeline X are also well stocked with ports. In terms of looks, we have to say we were a little disappointed. 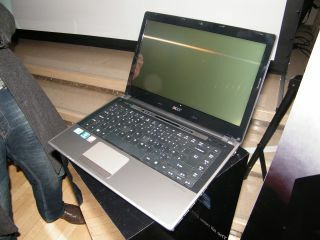 Acer has tried with a lovely brushed aluminium finish, but when open the systems don't exactly scream beauty. They do, however, seem to have a fine quality about them. The keyboard is a little spongy, but will only take a little while to get used to, while the trackpad and mouse buttons were pleasant to the touch. Side ports are incorporated well into the chassis, too. For the record, the lowest power processor in the line is the Core i3 330M, going up to the Core i7 620M. All also have Windows 7 Home Premium and Dolby Home Theater v3 technology.